Call center agents or virtual office agents are the human element of your brand that create a lasting impression and contribute to the lifelong value of your clients. Simply put, they are the main determining factor of whether a customer will continue conducting business with your organization. And with the speedy evolution of call centers over the years along with technological expectations of customers that go beyond a simple phone call, companies have had to adjust for them to be able to interact with customers in channels that they prefer. This among other factors has necessitated the need for new and existing call center agents to learn new skills and qualities to enable them to successfully handle customer requirements in multiple platforms. The core objective of an agent is to provide the highest level of support to clients. To achieve this, he or she needs to be able to learn quickly and retain as much information about your company. By the time he/she starts picking up calls, she should know at the very least the fine points of the services or products you are selling. She/he should also know when she cannot resolve an issue and to which department the call should be transferred to during such an event. One important thing to keep in mind is that customers will naturally have more confidence with a virtual office agent who answers their queries promptly without continuously keeping them on hold to consult the knowledge base. Call center agents who are able to understand and handle situations in a professional and courteous demeanor when a customer calls with a problem or concern develop a strong relationship while at the same time make the caller feel that someone is concerned about their situation. A good call center agent is not easily agitated. Often, your virtual office will receive calls from aggravated customers. However, how well he/she handles the pressure is what defines a good agent. A good agent will keep the situation cool will not allow it to affect him or her at a personal level. This may seem obvious but worth pointing out. Effective communication is the foundation of understanding. From correct use of language, to proper etiquette and to finally ensuring that customers get the required support and advice is what makes a successful call agent. There is simply no competence without effective communication. Finding the perfect virtual office for your business may feel challenging. 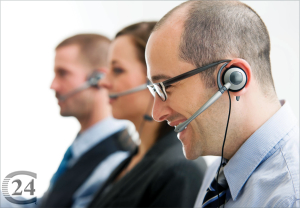 Look for an answering service whose call center agents have these success qualities and more. Contact Call24 today for an always free Consultation.